Metropolitan Police officers suspended for corruption! 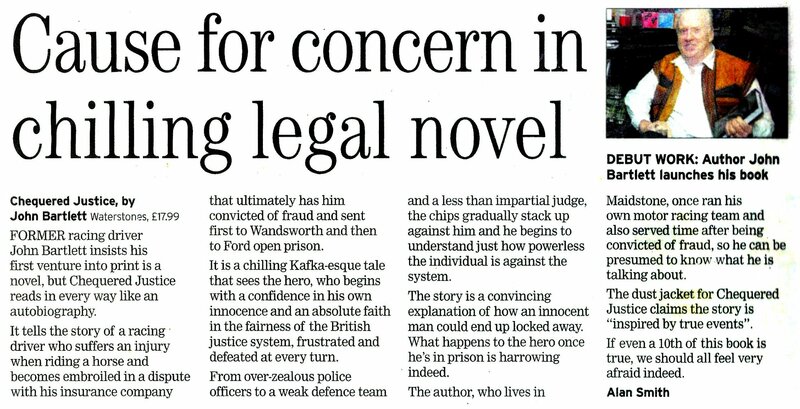 The motivation behind my books has always been to expose the corrupt practice and enduring culture of cover-up, considered acceptable within our justice system. Chequered Justice in part, highlights the officially sanctioned practice of allowing police officers to ‘fudge’ witness statements. This accepted abuse, undermines the entire judicial process. It scars the wronged for life, resulting in the same long term psychological injuries and PTSD suffered by child abuse victims. Allowing police officers to modify, fudge, change, tweak or spin their own version of events on behalf of a witness, to support the Crown’s version of the truth, is a deceitful practice, known about for decades yet still being allowed by our Justice System! In my case, after breaking my back in a life changing accident and the resultant claims against my insurers, I was arrested and charged with supposed fraud. That in itself was bizarre enough given the x-rays and clear medical facts, but what followed was unbelievable; a total betrayal of the impartiality and neutrality the public has a right to expect from our justice system. Months after being accused of faking my injuries, we discovered that Crown witnesses (my insurers) had had their statements ‘faked’ by an officer in the Metropolitan Police. Other Crown witnesses had then been coerced into copying the ‘master faked statement’! What makes this injustice even more fantastic is that the Metropolitan Police had in their possession, confidential internal documents from the same witnesses, confirming the permanent nature of my injuries. 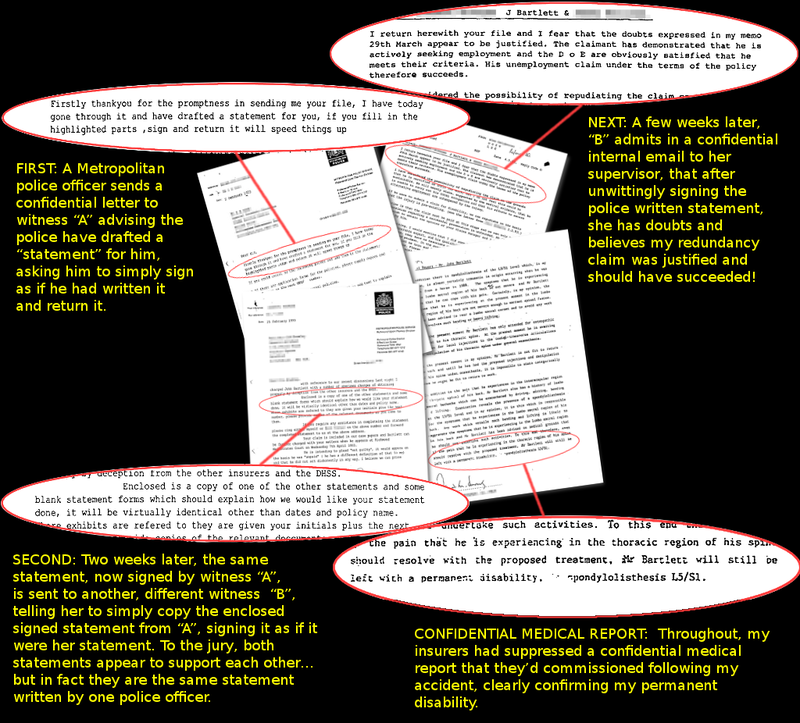 Prior to the trial the Metropolitan Police also had internal memos and a medical report from the same insurance company, confirming my claim had met their criteria and should have succeeded, the memos being dated after they had signed the “faked” police statements. Was my case unique… or is corruption endemic through the British justice system? This type of manipulation was never unique to just my case, it’s been systemic throughout our justice system forever. Former Metropolitan Police chief John O’Connor, speaking of the raid and investigation of Sir Cliff Richard, called that “the worst example of police manipulation I have ever come across”… but that is just one high profile case. Another 258 officers were suspended for offences including sexual assault, corruption, neglect and assault, 38% of cases were proven and 11% of officers were sacked. Around 50 Metropolitan Police officers were suspended for corruption in just three years , the officers being paid approximately £3.6m during their suspensions. in the past, including my case (see documents below) and society needs to urgently address what in essence is a very clear perversion of justice and perjury. In November 2013 the BBC reported on the police practice of manipulating crime statistics, also known as “cuffing”, “nodding”, “skewing” and “stitching”. This blatant fraud is still routinely used to manipulate crime figures (making them look better) to meet targets and secure extra Government funding. If the Crown thought they had a genuine case, why would they need to ‘fake statements’ and tutor witnesses with their answers? Why, when each witness with a “faked statement” admitted under cross-examination that the statements were wrong, did the trial judge disregard this in his summing-up, reminding the jury of the wording in the original “faked” statement? Why did the trial judge breach court procedure by allowing the police officer who’d produced the “faked statements”, to remain in court making notes of what each of the witnesses said in the witness box, prior to giving evidence himself? Was there a bigger story going on? Creating lies, to support the Crowns version of the truth? To the jury, and anyone reading the news reports, it simply looked as if I’d faked an injury claim and my subsequent redundancy…. as a result, I was sentenced to a total of 6 years in prison. My father had died just prior to my trial, leaving me some money in his will. His gift to me was therefore confiscated by the Crown under the “Proceeds of Crime Act” (usually used against money launderers and big time criminals), because I’d received the inheritance during the period of my supposed “crime”. My inheritance was therefore handed to my insurers… who in turn made a sizeable “donation” to the Metropolitan Police. The big question is why would any police officer do this? I can only speculate (see my Blog). However, often when evidence against an accused is weak or non-existent, the prosecution revert to what is known as ‘Character Assassination’… that ‘s what happened in my trial. Have a look at this article. If a police officer is convinced you are guilty and looks only for “evidence” to prove his theory… the truth becomes unimportant. 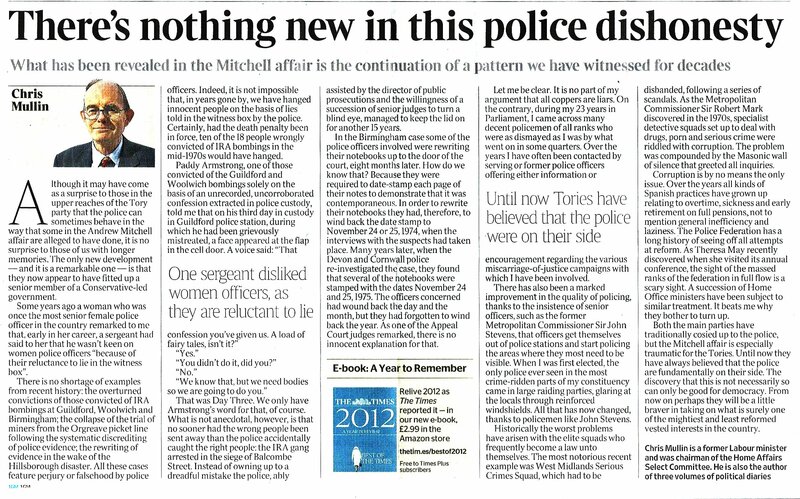 Chris Mullin, former Labour minister and chairman of the Home Affairs Committee, talks in The Times about the “Masonic Wall of Silence” protecting our corrupt police. Is it actually legal then for the police to put words in witnesses mouths? I always believed witnesses statements where just that! I’m sure it’s not “officially” supposed to happen but it does, and VERY regularly. The Metropolitan Police (the force responsible for the above statements from my case) are well known for setting up the accused in this way. It’s considered justifiable as it helps secure convictions and keeps costs down. But it’s not just the Met Police… it appears to happen throughout the UK’s police forces and is clearly unofficially endorsed by our justice system. Certainly in my case, the judge was fully aware of what the police had been up to but he refused to allow the jury to know, saying: “I will not have one bad word spoken against these fine officers in my court! “ A quick Google will find hundreds of wrongly convicted people, often due to evidence having been fabricated by police! Perhaps now is the time for you to sue them……..?